Considering divorce later in life? Consult with Govan Law. Considering Divorce Later in Life? Divorcing in your 50s or 60s presents a different set of circumstances than for those who are younger or have been married for fewer years. Particularly for women who have devoted their time and efforts to raising families in lieu of working and whose potential future earnings are significantly less than those of their spouse. For many women this means that their future earning potential has significantly diminished. An experienced divorce attorney who understands the value of your contributions to the marriage is must. You devoted your life to your family and spouse, and those contributions are just as important as your spouse’s income contributions. 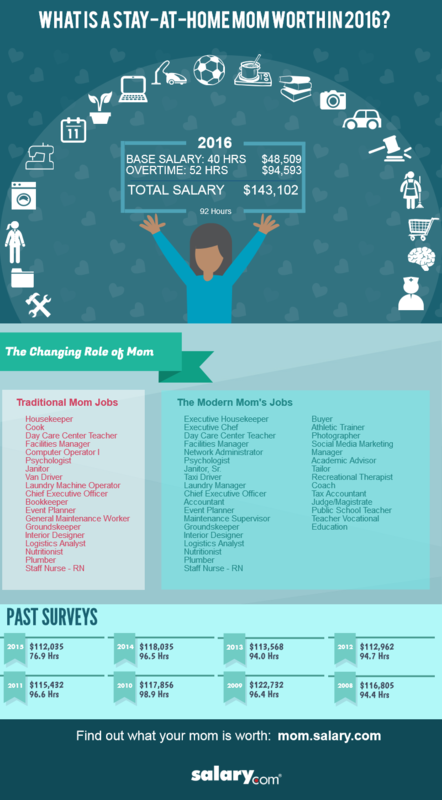 According to Salary.com, a homemaker in 2016 is worth over $143,000 [see infographic at left]. In order to ensure that your future needs will be met, you don’t want to go into divorce unprepared. The steps that you take at the beginning of your divorce could set the tone and the course for a good resolution or a poor resolution. An experienced attorney can help guide you towards making the right decisions and avoiding the potential pitfalls that could incur if you don’t understand your rights. The ability of each party to pay: If he earns more or has the capacity to earn more than you moving forward, you are likely to receive spousal support. The employment history and income potential of each party: This does not mean that because he earned more, he deserves more. Quite the contrary—if you earned less and will continue to earn less, that presents a better argument that you NEED spousal support. The contributions of either party as homemaker: Your efforts raising a family and maintaining the home ARE valued by the court. The standard of living of the parties during the marriage: Often when parties divorce they can’t maintain the same standard of the living as they had during the marriage; finances just don’t allow for it. But if your husband’s earnings can support a certain standard of living, the court will take that into consideration. Matthew Govan is a Family Law Attorney located in Portland, Maine. He has been practicing law for more than 10 years and is well versed in Traditional and Collaborative Divorce. Matthew represents both women and men and has significant experience helping clients with complex financial and property needs. You can read more about Matthew and his team here.